In arguably Oregon’s most important matchup of the season, the Ducks traveled to Maples Pavilion at Stanford University to take on the No. 11 Cardinal. Oregon had not won at Maples since 1987, and no team this season has beaten Stanford at home; it came into the game with a 22-game home winning streak. Well, records were meant to be broken, and the Ducks broke both of them on Sunday. Oregon needed to start off strong or run the risk of falling behind an offensively potent Stanford team. After a turnover and some missed shots, Oregon fell into a 4-0 hole early, but then went on its own 14-0 run and opened up a 10-point lead. After that, Oregon never looked back. Oregon went into the second quarter with a 20-11 lead and quickly doubled it. Oregon outscored Stanford 24-9 in the second quarter, scoring impressively from the inside and out while forcing Stanford into tough shots and turnovers. Over the last 8 minutes of the second quarter, Oregon had a 22-4 run and went into halftime leading 44-20. In the second half, the story was the same. Oregon won this game on its own terms, and not anyone else’s. The Ducks methodically played their offense to the best of their abilities, running that familiar and deadly pick-and-roll game and finding shooters who came off of down screens. The Ducks really cemented their lead in the fourth quarter, after the game was long over, outscoring Stanford by another 10 points, including hitting 5 three-pointers. This game was a truly special showing from the Ducks, as they went into a hostile environment and broke two To me, the win was a heads-up to Oregon State and the rest of the teams in the country that if they want to beat the Ducks, you'd better bring your A-game at all times. On that note, a game like this deserves some praise, which is why we’re going to start this edition of Good, Bad and Ugly. In a blowout win like this, Sabrina Ionescu being at the helm is nothing new. But blowing out Washington State by 40 and blowing out No. 11 Stanford by 40 are two different things. Today, Sabrina finished with 27 points, 9 rebounds and 8 assists, falling just short of her 17th career triple-double. Sabrina was in control of the game from the very beginning, and it was clear she wanted this win game badly. Sabrina and Ruthy Hebard ran the pick and roll over and over again in the first and second quarters, and the Cardinal found no answer for it. It was the most obvious “pick your poison” moment of the year: If the defenders left for Ruthy on the roll, Sabrina would pull up and hit a floater or jumper. If the defenders tried to defend Sabrina, she would dish it low to Hebard for the easy layup or find her outside shooters. Sabrina was in complete control of this game, and really showed why she should be the national player of the year. Coming in second was Hebard, who was extremely vital in Oregon getting out to a hot start. Each time Hebard touches the ball in the post, there’s a really good chance Oregon is going to get some points. Hebard finished with 18 points and 8 rebounds on 8-12 shooting, which is slightly below her season average of 71 percent. 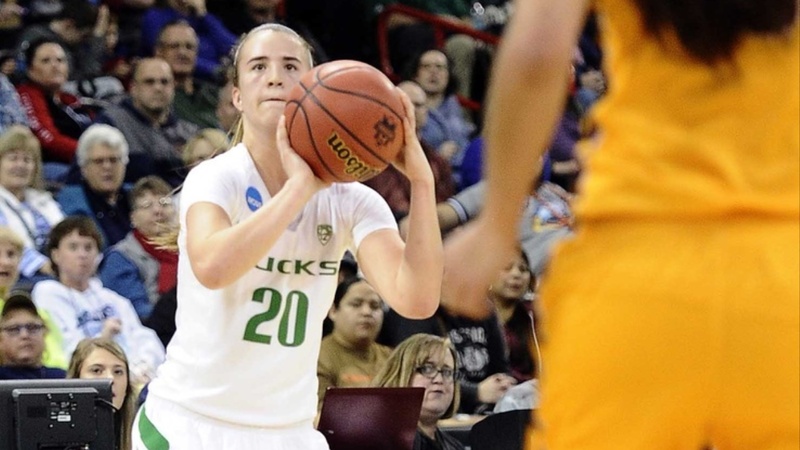 Oregon likes to go to Ruthy down low to start games, because of just how easy it is for her. Her post moves won’t “wow” you in any way, but she has a fantastic feel around the rim and very rarely misses a shot in the post. The hot start that Ruthy provided was just what the Ducks needed to put this game away. Oregon didn’t have anyone else score more than 12, but, Erin Boley provided a dozen points on 4-6 shooting with 4-4 from downtown. Going into the game, I thought that Boley was going to be extremely important because of Stanford’s inability to cover the three-point line. Boley shot the ball only 6 times, but that was all she needed to do. All of her looks from behind the arc were wide open, and Boley in space just won’t miss. She may be little more than a pure shooter on offense, but she does it better than a lot of people. We all know that if she can get into a rhythm, she's money, shooting a scorching 44 percent from three on the season. Boley is simply one of the deadliest sharpshooters in the country. Oregon’s team defense was outstanding. It held a very good Stanford team to just 31 percent shooting and 23 percent from beyond the arc. Stanford averages 78.7 points per game, and the Ducks held the Cardinal to just 48 points and cut its average field goal percentage (45.4) by almost half – and on its home court. This was an impressive performance across the board by the Ducks, who routinely switched their defensive alignments from man to zone and back to man. The zone defense in particular caused Stanford a lot of issues; it's something a lot of teams struggle with. This Duck defense will have to hold steady for the rest of the year for the Pac-12 title to be theirs. A couple of team stats to finish off the Good section: Oregon dominated the rebound matchup by 15, grabbing 41 possible rebounds to Stanford’s 26. Oregon shot an impressive 12-16 from the three-point line; if the Ducks do that, I don’t think anyone in the country can beat them. If there was one thing I wasn’t a fan of while watching this game, it was the free throw numbers. A lack of good officiating may have played a role, but I digress. Oregon only shot 5 free throws. It certainly did not affect the outcome of the game, but I would’ve liked to see the Ducks be more aggressive in getting to the line. No ugly today, unless you’re a Stanford fan. The Ducks take on No. 7 Oregon State at home on Friday, Feb. 15,ASC at 6 p.m. Should be another fun game. Go Ducks.